Prior to becoming Megan Rix I already had an established career as a writer of children’s books and TV shows under the name of Ruth Symes but once Traffy, and then Bella, came along my daily word tally quadrupled. I now have 4 multi-award winning children’s books about dogs in World Wars 1 and 2 with Puffin and more on the way. My dogs are in all of my books and not just in the acknowledgements. Bella loved my husband’s socks and only his socks when she was a pup (how did she know they were his?!) and Buster in ‘The Great Escape' has a nose for identifying various members of his family's slippers. Both Traffy and Bella howled as pups like Howl does in ‘The Victory Dogs’ and Bella's love of ball-play is shared by Grey in ‘The Bomber Dog’. 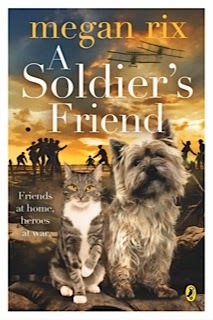 Not forgetting the football playing dog at the Christmas Truce of 1914 in ‘A Soldier's Friend’ inspired by a partially deflated football that was given to us down at the river and played with by an excited pack of dogs from tiny terriers to large Labs. 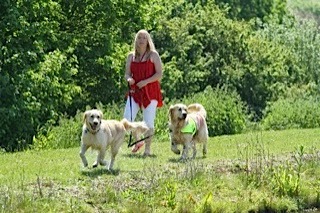 My days usually start with a long dog walk by the river (with Traffy and Bella often in the river). Sometimes I write in my spare-bedroom office but only one dog can comfortably squeeze in there. They prefer it when I use the conservatory to write in but they like the door open and it can get a bit cold in the winter! The best place to write is on the bed – fortunately I love writing first drafts by hand. Judging by how Traffy and Bella always clamber on and within a few minutes are fast asleep and often snoring they like this writing spot best too. A couple of hours later Bella's ready for a break and will remind me by dropping a ball on my lap if I'm working in the office. If I push the ball away she'll pick it up off the floor and drop it on my lap again and again. She’s one persistent puppy. Taffy will also pick up a toy (an orang-utang is her favourite at the moment) and shake it and push it into my hands. I’m never able to resist them for long. Bella taught me about ‘show not tell’ the other day. I'd taken the dogs for a walk by the river and still had Bella's ball in my coat. My husband noticed her biting at my coat pocket (the coat was hanging up) and asked her what she wanted. Bella went and found a ball and put it next to my coat where the ball she wanted was. I’ve also had dogs bringing me my wellingtons when I’m late taking them for a walk. Dogs love sign language. It’s so much clearer for them than the burble of words. Often in obedience exams sign language isn't allowed but I'm sure if the roles were reversed and we had to guess what a dog was saying from his barks we'd appreciate a handy hint or two. Being home along is never lonely when you have two dog shadows wherever you go. Even when I get up at three in the morning to do some work and creep out of the bedroom so I don’t disturb my sleeping husband Traffy and then Bella will pad down the stairs after me and curl up next to me on the sofa-bed in the conservatory. They always know when I'm going out for the day because I'm putting on make-up and not wellingtons and they don’t like it. But coming home to be greeted by two exhuberant dogs is just the best thing ever. Bella races to grab a toy to give me and Traffy picks up a chew so she can ‘talk' and my normal dog walking, ball throwing, toy playing, writing routine resumes. Megan Rix will be talking about her books and Animals in War with Damian Kelleher at the Hay-on-Wye literary festival on the 27th May. Her dog Traffy may also put in an appearance. Her book 'The Victory Dogs' (set during the Blitz) is Stockton-on-Tees children's book of the year 2014. 'The Bomber Dog' (about a parachute dog) is this year's Shrewsbury's Bookfest award winner. 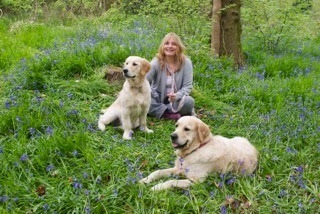 Very much enjoyed reading about you and your dogs, Megan! I can only share the family dog, Sally, rather than have my own as I live alone and travel a lot, but I definitely find dog walking one of the best forms of unwinding from editing and writing. Funnily enough, when I go to primary schools and ask them what I should write about next, the number one answer is DOGS.